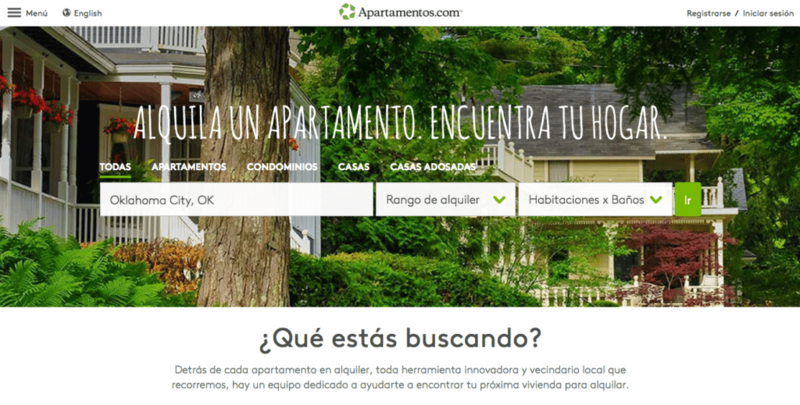 CoStar has added Apartamentos.com, a Spanish-only apartment listing site, to its list of offerings. Apartamentos.com will have all the same features of Apartments.com, including the Polygon search tool, 3D tours, and other in-depth neighborhood statistics. ¿Hablas español? CoStar can now say “sí” after launching Apartamentos.com, the Spanish-only version of apartments.com — the largest and most visited apartment listing network in the United States. “Apartments.com is just now celebrating its second anniversary of the site re-launch centered on enhancing the renter’s experience. We have been very pleased with the profound response. We have delivered more than 57 million leads to advertisers.We make the rental process easier for consumers by offering one site with complete and accurate inventory and comprehensive information,” said Andrew Florance, Founder and CEO of CoStar Group in a statement. Apartamentos.com comes with all the bells and whistles of its English counterpart — which includes the Polygon neighborhood search tool that helps users narrow down the area in which they’d like to live, interactive 3-D tours, and other comprehensive neighborhood content. Furthermore, users will be able to view listings for condos, homes and townhomes for rent. Apartmentos.com’s listing results using the Polygon tool. Each of Apartamentos.com’s listings have been translated by humans for the most accurate results, and property managers have the option to receive leads in English or Spanish, with online translation available. Additionally, the site will be adding a feature to help Spanish-speaking renters find properties that have Spanish-speaking personnel on site.